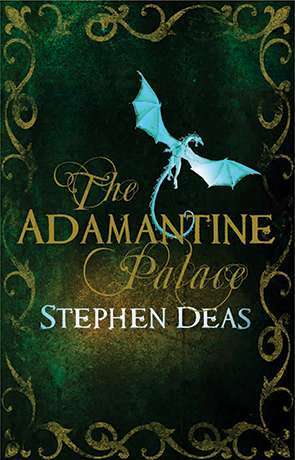 The first of Stephen Deas’ dragon series and published in 2009, The Adamantine Palace sets the stage of scheming between the noble factions and royal houses. Prince Jehal, Queen Sheriza, Queen Zafira, Speaker Hyram and others battle for power. Like many fantasy works, Deas’ society does appear top-heavy to begin with. The main focus of writing is on the noble classes as they wing across the map to each other’s eyries trying to score political points. At this stage, the dragons themselves are somewhat subdued and for much of the first half of the book fulfil the role of personal flying transports. The exploits of Kemir and Sollos are the counterweight to this as mercenaries in the employment of Queen Sheriza, but it does take a little while for their characters to rise out of the generic. That said, as Deas shifts through the gears the book gets stronger and stronger. The twisting intrigues of Zafir and Jehal are cleverly kept unpredictable, despite us gradually learning more and more about them. The character of the dragons gradually emerges as their situation becomes clear. It is rather like the author dealing out his plot cards very carefully as he goes through the chapters. There is perhaps too little at the beginning in this regard, particularly when evoking a picture of the societies and classes Deas introduces us to. It becomes clear there are tensions between dragons and nobles and lower classes and nobles. There is obvious intention to use this as part of the conflict of the ongoing series. Getting a better glimpse of the life of the different social strata early on and an image of the different settlements would help with this. The lineage structures outlined in the start of the book would seem a lot less important than this and it is clear Deas can supply the requisite writing. Chapter 41 would be a clear example of just the kind of fare that would make Chapter 1 a little stronger. In general, more writing dedicated to providing an image of what we see and what transpires would help. I found myself leaving the book without clear pictures of any of the characters and only some of the later scenes. The Adamantine Palace is a book that grows on you. The pages turn fast, the politics draws you in and our gradual discovery of circumstances promises much for the later series. There’s a character absence that sets up the sequel The King of the Crags right from the start and plenty of loose ends left over to ensure that will continue the story right from where it finishes here. Written on 9th September 2015 by Allen Stroud.